Above: Vito Scaletta hides from my review. 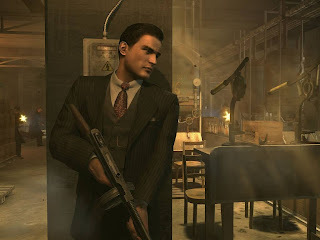 My review of Mafia II is up at thephoenix.com. 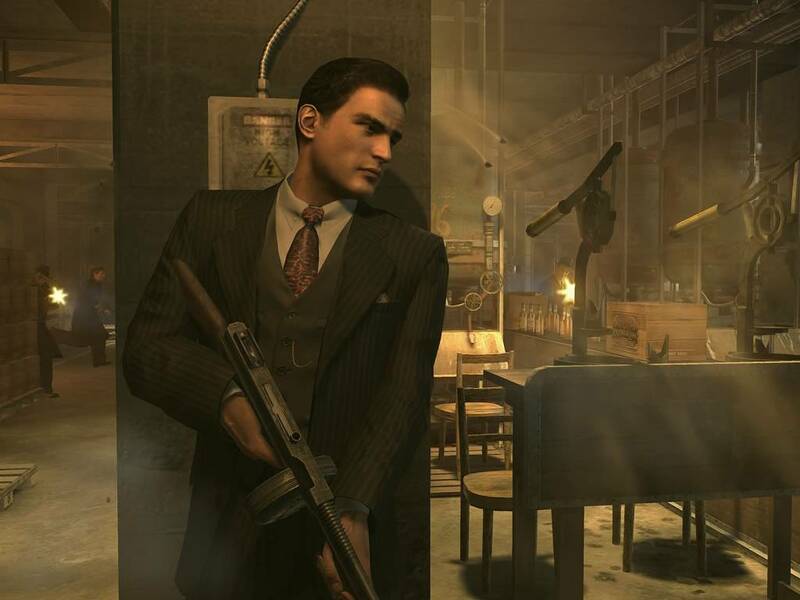 The story needs to be good if you're going to play through a game like Mafia II, because the structure is very much cutscene-gameplay-cutscene. It looks like an open-world game, but it doesn't play like one. Were there side missions? If so, the game did a good job of hiding them. Not that side missions are the most important part of a game. I just mean to say that when you're driving down a street in Empire Bay, you do not stop to explore anything that catches your eye. You keep going to your next objective. When Mafia II is bad, though, it is bad. I couldn't believe how awful the shootouts were. The enemies are bullet sponges, which is very much at odds with the game's ostensible realism. Targeting was next to impossible (I eventually discovered that there was a smidgen of auto-aim if you snapped in and out of cover quickly enough, but it usually didn't help). And the worst thing was, they all played out exactly the same way: rote duck-and-cover sequences taking place along straight, narrow corridors. Even outdoor shootouts found a way to lock you into what were, functionally, crate-filled hallways. My experience with the game came to follow a pattern. First, a slow burning enjoyment, as I eased myself into the slow pace and focused on the story. Then, bewilderment and frustration as I came upon some idiotic part of the gameplay that I usually ended up repeating several times. Any spell the game started to cast would be broken. The worst thing about it is that I would like to be talking about Mafia II solely in terms of the story. I'd like to be talking about what it's saying about loyalty and friendship. I'd like to be praising not only the direction of the storyline, but the obvious pitfalls it avoids. And in a sense the game would deserve that. But it's too hard to see past the basic mechanics of the thing to do that. It's really too bad. *Though GTAIV's story is the far more dramatically interesting of the two.